Sometimes, what seems like a good idea turns out badly. I made cinnamon rolls. It's not like I've never made cinnamon rolls before, in fact I made some less than a week ago that were a-maz-ing. This time, things didn't go so well. The bread recipe I use for the cinnamon rolls is the one I use for everything- hoagie rolls, loaves, bread sticks, etc. I made a double batch. Not a bad idea, as I also wanted to make some yum hoagie rolls for sammiches. The problem I had was taking too much of the giant lump of doughy goodness. The area I roll things out in is small. Too small for the amount of dough I had. It ended up being about ½ an inch, if not a little more, thick. WAY too thick for cinnamon rolls. They didn't want to bake evenly. My biggest fail? Well, you know those tiny half containers of spices? I only have 2. A ton of the regular sized ones, but only two itty bitty ones. I grabbed the wrong one. Instead of nutmeg, I dumped in Allspice. *gag* I did try to get it out of the mix before it sank in. I wasn't fully successful sadly. Did I toss out the mixture and start again? No. It'll be FINE, I thought. Not so much. Of course I didn't want to toss out half a cup of butter, but still. ½ cup butter. You want it to be melty. Mix everything together and spread on the inside of the dough, then roll up. Put leftover mix (if there is any) in the bottom of your pan, and dribble a little on the top of your rolls. O hai! I finally gave the cake to him, so I can post it now. Yay! He loved it. 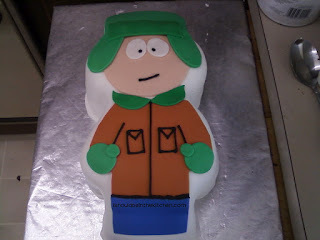 I made my brother Kyle a Kyle from South Park cake. I'm pleased at how it turned out. Next time I will do a few things differently, but for the most part I am quite happy. The fondant on the side isn't that great, because I don't have a fondant smoother. I think for my first real fondant cake I did well. I had to cut it out by hand, as I didn't have a pattern (or a cake pan that matched!). It's a double layer chocolate cake, with cream cheese frosting and a buttercream crumb coat. 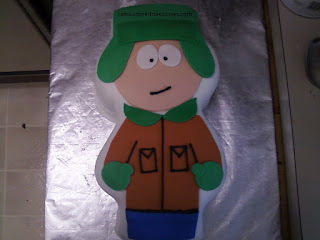 All of the fondant pieces are hand cut, with the exception of the mittens, which I used my Wilton round cutters. Beginnings of this years garden! I have begun my garden for this year. By saying I've started, I mean that I have planted seeds that are now (mostly) little seedlings for plants that need a little more time going inside. Some I just sowed a couple of days ago so I have no sprouts yet. If you want to follow the progress of my garden, check out my "social" garden here: Herbal & Heirloom I will be posting there about what I am doing in the garden and what all I am growing. So far I have started peppers, tomatoes, cucumber, beans, a few different herbs, and I have planted my potatoes in their permanent containers and will keep adding soil as needed. I also started an apple tree from seed, so we will see how that goes. At this point it is doing quite well. My sage is doing well in it's little spot out on the porch. I planted it last year, and it seems quite content. Other than adding a little coffee grounds and egg shells every now and then, and light watering, it has been thriving with pretty minimal help. I am going to try to container grow a few things to see how well it goes. What exactly those plants will be I haven't determined yet. I might try to grow a few tomato plants in the large containers I have, but I want to companion plant them with some basil. I am not using any chemicals/pesticides and my garden will be all organic.